Find out more about our research or read the Policy Report, detailing our impact. Click on the link to see the recent article about Poo Patrol in the Bristol Post. You can also click on this link to see a short YouTube Video. Find out about Poo Patrol's Spray Day on the 26 May 2017. 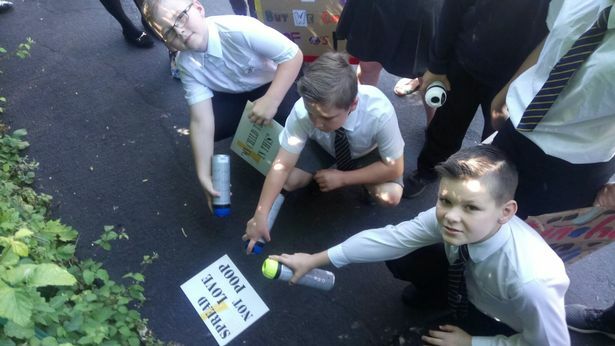 Schools in Bristol were engaged through the Sustainable Learning Initiative to sign up for the Big Spray Day event, along with community groups. We ran competitions for poster and stencil designs by children, and produced stencils to display the best slogans. Lessons developed awareness of the issues around dog fouling and worm infection, whilst helping to elicit creative solutions and interventions. In total 25 schools and 16 community groups registered. Teachers took classes out locally, where they spray-painted dog fouling and stencilled slogans, displayed pupil-designed posters, and entered data including numbers and locations. Community group actions also co-ordinated with those of school classes. Two weeks later, we repeated the exercise in order to measure the impact on the rate of fouling and, as a result, identify hotspots for cleaning and future anti-fouling action. View images from the big spray day.